RKRc Forum: A haven to discuss the compelling dynamics between Kylo Ren and Rey from Star Wars. So what is "Reverse Anidala" and how do you see it playing out in the next two movies? Re: So what is "Reverse Anidala" and how do you see it playing out in the next two movies? I was too lazy yesterday to make all gifs and callbacks from PT. Thank you for posting! Good finds, the one with Anakin and Rey running from a Darksider is very similar. Too bad Rey has not her date haircut from TLJ, she would have looked even more like Qui-Gon. I wonder if there is more in the teaser. By the way, I saw people call Rey a Mary Sue because of her jump, but now I'm reminded that Qui-Gon did the same and no one batted an eye. I'll never understand some people. @LadyGaufrette wrote: By the way, I saw people call Rey a Mary Sue because of her jump, but now I'm reminded that Qui-Gon did the same and no one batted an eye. I've seen that too, and I don't understand it because there was a lot more over-the-top jumping around in the prequels, for example Anakin was jumping from and landing on moving vehicles early on in AotC or the duel of Anakin and Obi-Wan in RotS, and I don't recall people calling them Mary Sues. 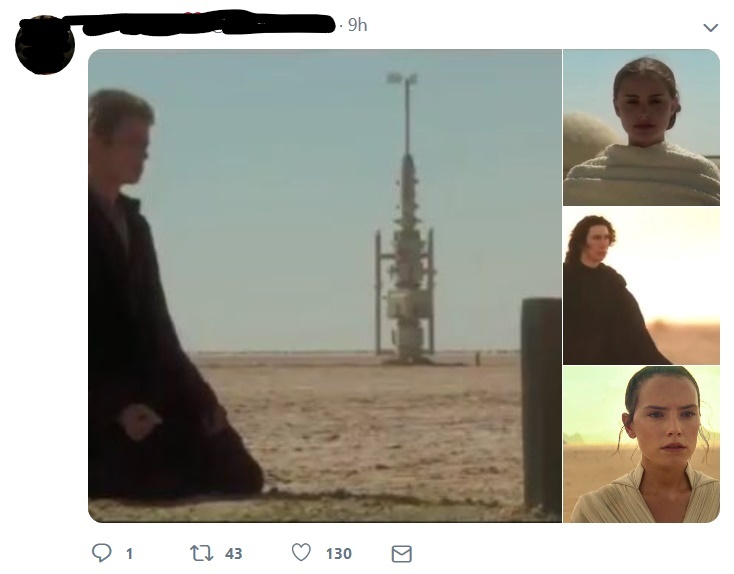 That's simply because Rey is a woman. This is called sexism. I'm happy someone made this parallel because my first impression with the image of Kylo was that he looked similar to Anakin looking at this grave. Which made me fear for Leia's fate. 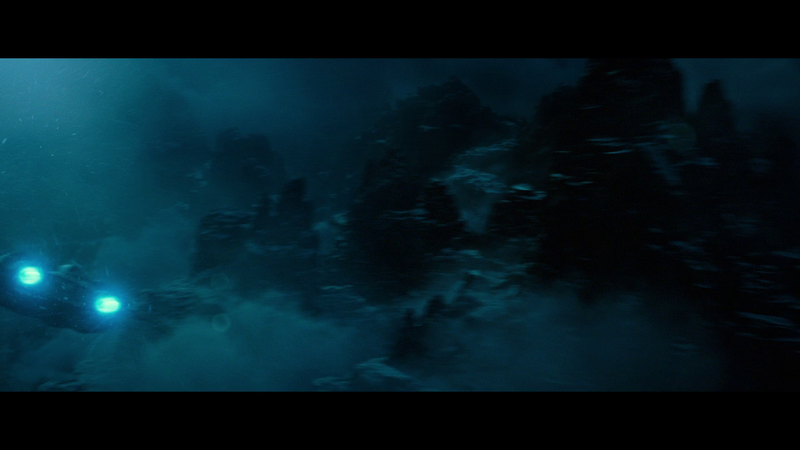 However for Rey I though she was looking at her parents' graves when it's not the case. Maybe I'm thinking too much about this. Maybe it's just me, but I find the discovery of the Gungan capital similar to the discovery of this new city in the teaser. The mountains in the night look like the bottom of an ocean. I like that thought! What a great parallel. 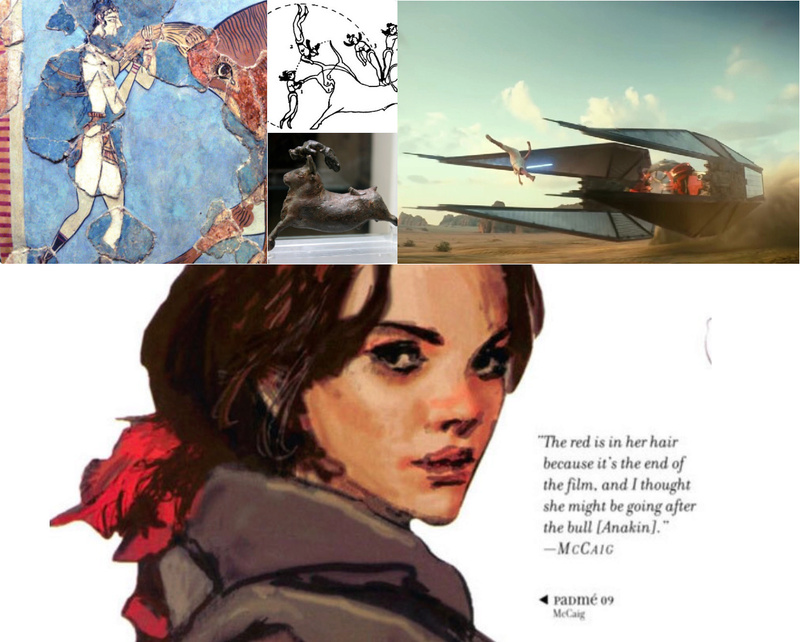 I was reading corseque and ashesforfoxes twitter discussion on the symbolism of Minoan bull dancing (I don't know if they're on this forum), and they found a new parallel between Rey and Padmé. The only problem is Rey doesn't have any red clothing. But you know who has a brand spanking new ship with red detail? 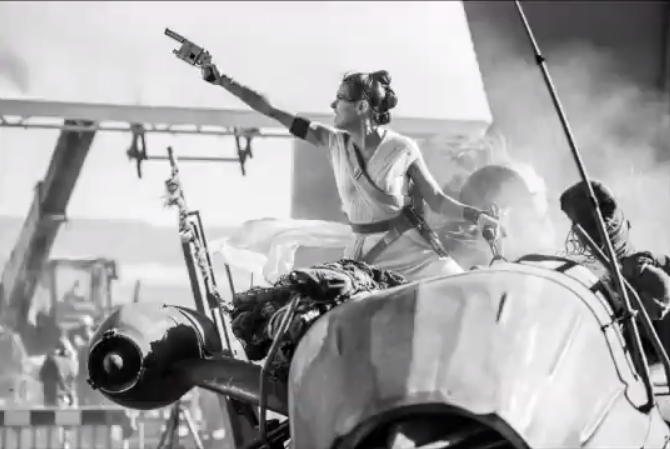 Maybe Rey's the bull and Kylo's chasing after her. I like this inversion, and after all, reylo is reverse anidala! Oh, it's a good one! 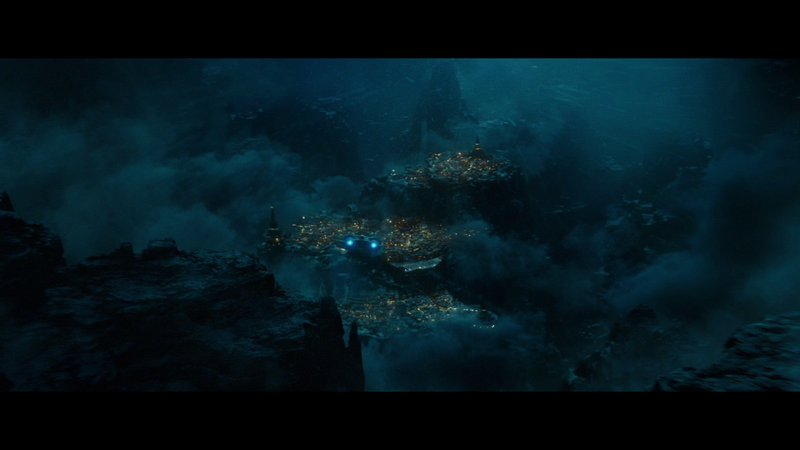 @LadyGaufrette wrote: Maybe it's just me, but I find the discovery of the Gungan capital similar to the discovery of this new city in the teaser. You're right, I can see it. Though my first thought was that the teaser scene was similar to the arrivals on Geonosis and Canto Bight in AotC and TLJ. I noticed another scene that made me think of reverse Anidala. When Anakin kills towards the end of his trilogy, he is looking at an eclipse. We get similar imagery for Kylo at the start of his trilogy when Rey and Finn look at the "eclipse" from Starkiller Base and he kills Han. With the return of good ole Sheev, I am convinced more than ever that Reverse Anidala is real, and the concept is going to be very in your face in Episode IX. Even casual movie goers who have seen the prequels will understand the concept. Whereas in the PT, Palps manipulated Anakin's love for Padme, poisoned it while both encouraging it. With Rey and Ben, he is going to do his best to keep them apart, and fighting with each other. And instead of hiding secrets as Anakin did with Padme, Ben is going to be very open with Rey about everything that's happening and that he knows. Ben may have done a lot of things in his life, but one thing he has never done is lie - especially to Rey. And instead of lifting up Palpatine to power as Anakin did, Ben is going to be the one to finally snuff him out - finish what Vader started. OMG! Thank you. This is the first reference I have seen referring to Anakin as the bull. Perfect! Anakin & Obiwan/ Kylo-Ben & Rey are the four cherubim on the Wheel of Fortune Card.. which is why it is my Avatar. But this is a subject for another thread.. I just wanted to acknowledge that you brought my attention to Anakin as the bull & Kylo's ship that looks like bull's horns. Again thanks. How did I never see this eclipse. It is a beautiful parallel between Anakin and Kylo, I'm happy that you showed me this. Glad you liked the topic. I don't have knowledge in all of this, so all I can do is share the informations. I'm curious to see the conclusion you'll make on what all this could mean. All the answers are with the Tarot/Oracle... I will make a separate thread so I can put the correspondences and everyone can come to their own conclusions. But, Reylo is written in the stars/constellations literally. Ring Theory was the thing that originally interested me, Rey's parallels with Obi Wan and reverse Anidala but there are deeper levels to the rings ( circles). While Anidala or reverse Anidala is an important element in the ST, it is not the MOST important, I think Jason Fry implied as much, that Rey & Kylo's connection is more complicated than "romance' and that is where Tarot is really useful in helping to identify the mythological motifs that connect the twin heroes.